Areas of Vicary-Racehorse have previously undergone historical mining (underground) activities during 1960 to 1978. Coking coals sold during this time were used by Japanese steelmakers to make coke for their blast furnace steel plants. Over 10km of strike length to the north of the historical mine workings will be explored. Located north of Coleman and comprises an area approximately 3km wide by 10km long. Located immediately south of the town of Coleman, Chinook South extends 12km south of Coleman along Willoughby Ridge, a prominent coal trend capped by the Cadomin Formation. 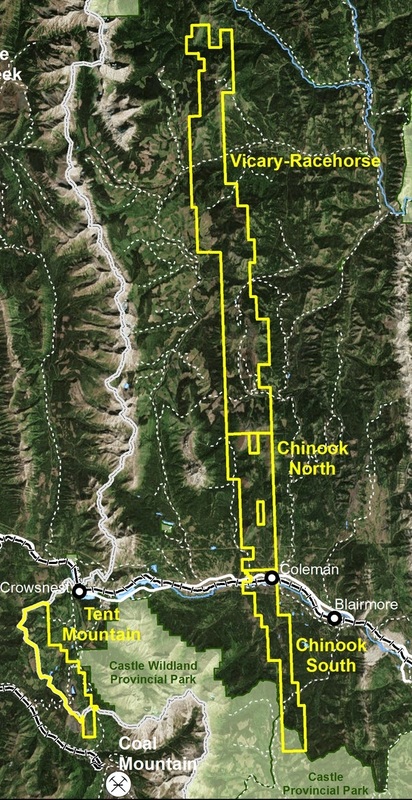 The northern portion of Chinook South, directly south of the town of Coleman, was extensively mined by underground methods from 1903 to 1952. A total of five coal seams of commercial importance have been identified on the Chinook South Property.